This year my children discovered candied cherries, and - oh - what excitement they've brought to our house! Eva just loves the green ones; Connor swears the red ones are the best. 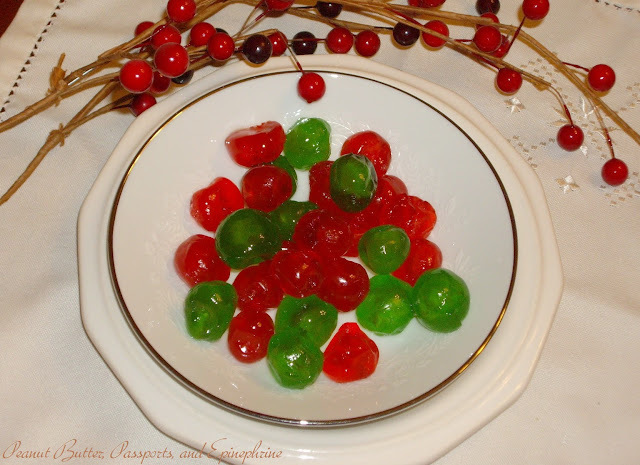 I become nostalgic, remembering my mother decorating dainty wreath cookies with these spectacularly colored morsels, which seem more in place gracing the Christmas tree than on our plates. And I try my hardest not to dwell on the artificial stuff that's in them. It's the holiday season, after all, and everything's okay in moderation . . . Moderation. So far I've purchased three tubs of these. And why on earth have you bought so much of something you normally wouldn't touch? you ask. It's simple - this year, more than ever, I've been lamenting the fact that we can no longer enjoy our traditional Panettone, imported from Italy, because of my daughter's nut allergy. I have yet to find an authentic Panettone that has not either been processed with nuts or contain Almond extract. So, when I walked past that display of candied cherries, fruit cake mix, and candied citron in the market around Thanksgiving time, I impulsively grabbed a couple of tubs. I had grand ideas about adapting a sweet bread recipe to create a Panettone in my bread machine. That didn't happen. Instead, the candies sat on the kitchen counter, steadily being eaten up by my children. 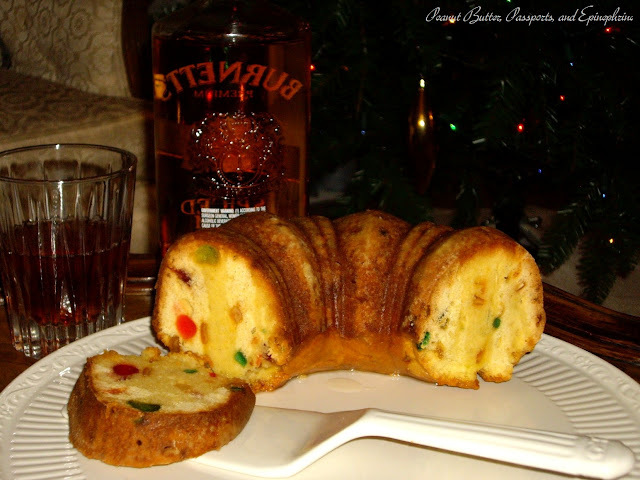 So, for Christmas dessert this year I decided on a rich cake, studded with fruit, that reminded me of Panettone. I found a recipe for Citron-Cherry Cake and adapted it suit my daughter's allergies and to satisfy my Panettone craving. My mother graciously baked it while I prepared the Christmas ham, and I cooked up a quick Rum glaze to top it off. It successfully filled the Panettone hole, and I think we've started a new holiday tradition. Preheat your oven to 300 F (150 C). Butter and flour a bundt cake pan. Cream the butter, sugar, and vanilla until fluffy. Add the eggs one at a time and beat well, then add the flour and fruit. Mix until blended and pour into the prepared pan. Bake for 2 hours and 10 minutes to 2 hours and 20 minutes, until a toothpick comes out clean. Cool 10 minutes in the pan. Combine rum, water, and sugar in a small sauce pan and simmer 5-6 minutes until the sugar is dissolved and the mixture is slightly thickened. Allow to cool slightly. While the cake is still in the pan, poke several holes in it with a toothpick to allow the glaze to penetrate. Spoon or pour a third of the glaze over the cake. Let the cake finish cooling in the pan. When cool enough to handle, invert the cake pan onto a serving plate and remove the cake. Poke a few more holes on top of the cake and spoon some more glaze on. Reserve a little glaze for the individual slices.